I didn't take too many pictures at the event, but I did borrow this image from our hostess Kimberlee of I Have A Degree In This. The panel speaker, Jolene Hart of Beauty Is Wellness, shared a ton of tips and practices on how to add more green to our daily lives and beauty routines. Avoid processed foods containing ingredients (chemicals) you can't pronounce and instead go for whole foods. Beige is bad, colorful is great! If you can eat it, you can put it on your face: raw honey masks are great for the skin, while eggs and avocados are great for the hair. These are tried and true methods that actually work. Stress and sugar are bad for the body. Happiness is the best medicine! Simple Detox: drink a glass of pure warm water and half a lemon's juice every morning (before your coffee) to help digest last night's food and balance out your system. I've been doing this since Friday -- so far so good and I feel so much better! Leena Sukumar (green top) of MySkin shared her knowledge and insight about going green in the beauty industry. In fact, more and more companies are using biodegradable packaging and glass containers to reduce waste. Are you opting for green packaging? 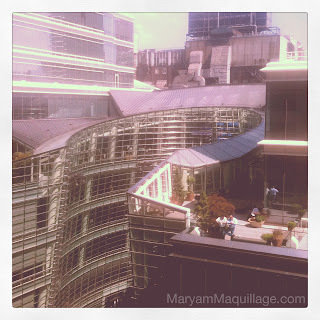 Check out the awesome view of the Bloomberg Building from the Miele Showroom and the fab goodie bag featuring Arbonne, Tarte, Sénica Naturals, QiLiving, Zen Society (review to come), Priti NYC (review + nail art here), and Zosimos Botanicals (featured in this post). 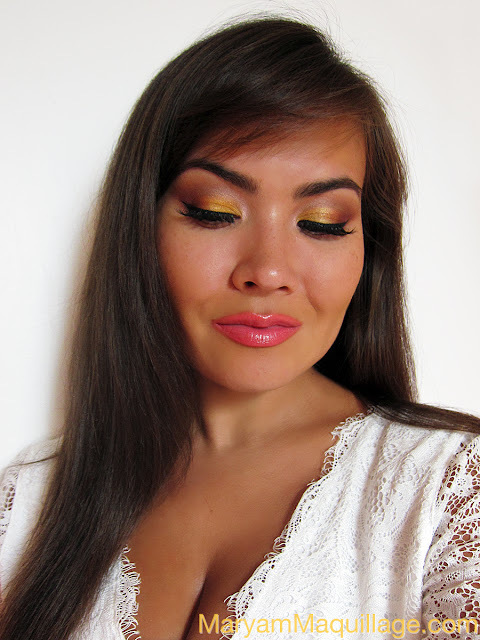 Featuring: Zosimos Botanicals -- (full review & Rockin' Organix makeup look here). The following products came from a set of 10 minipinch mineral eye shadows for brown eyes. Zosimos Botanicals mineral eyeshadow in Redbud -- outer "V"
Prime your lids and wait for the primer to set. Next, apply a shimmery sticky base (NYX -- Cashmere) all over the lids and spread it out evenly with your finger. Using a fluffy dome-shaped brush and windshield wiper motions, apply a matte neutral shade (UD -- Naked) to the crease and blend it out towards your eyebrow. Using a flat stiff brush and patting motions, apply a shimmery yellow mineral eye shadow (ZB -- Lemongrass) all over the lid. 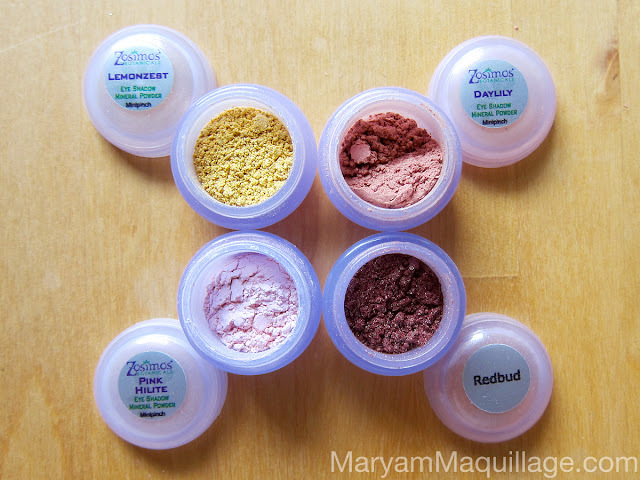 Clean off the brush and use the same technique to apply a burnt reddish-brown mineral eye shadow (ZB -- Redbud) to the outer "V" portion of your eye. 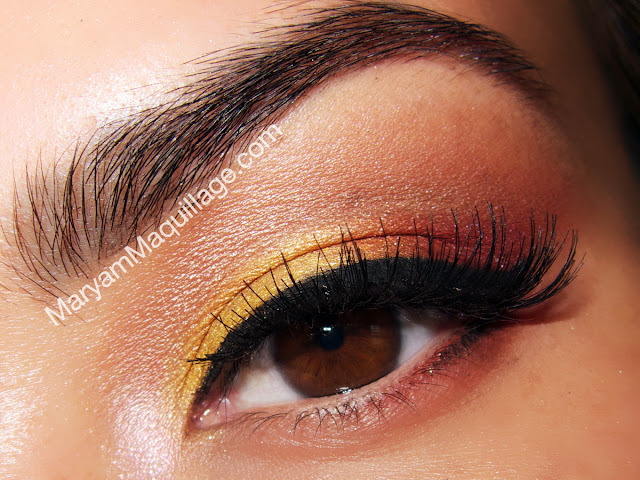 Apply a shimmery neutral shade (ZB -- Daylily) to the crease, meeting with the inner corner. Next, highlight the arch under the brow, as well as the inner corner using an iridescent pink shade (ZB -- Pink Hilite). Line the top lash line using a black gel / cream liner (Clinique True Black) on a thicker brush (I like Royal & Langnickel Silk Greenline liner brush number GL-5). Apply your false lashes and line again to conceal the band. You are simply Ravishing and Radiant with a stunning white lace dress and gorgeous decolletage ! Wow ! this is beautiful love the colors the lipstick is gorgeous on you. Love the tips as well good info to know! Maryam! You are gorgeous my dear! I love this. I want to be more green with beauty products too. It's definitely not easy to begin with!! you're right, it's not easy, and it can also be pricy... good thing there are a lot of makeup companies out there giving us green and eco-friendly options :)) thanks babe!! I might try the simple detox tip it sounds good! Great post! Do you style and wax/pluck your own eyebrows Maryam? They look immaculate!! The warm water and lemon juice trick is my favorite when I'm getting ready for fashion shows! I'm scared to try hair masks but my hair is so damaged I'm probably going to CAVE! The magic is beyond...zero words! giiiirrrrrl, try the hair masks -- but the natural types, in other words, if you can eat it, you can apply it to your hair!! yay, this was the makeup you had on when I saw you. You looked stunning-as always. My blog is about to reach 10,000 pageviews! I'm giving away a Wet & Wild Cosmetics Prize Pack to the winner, make sure you enter and fill out the widget! It's really easy, just follow all the rules. Open until August 31st. 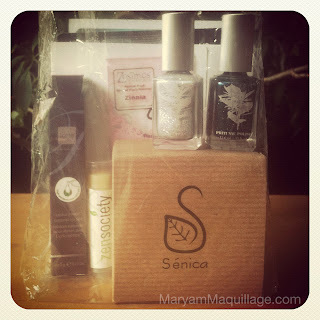 You've crafted such a gorgeous look and with some eco-friendly products... I love it! I'm happy to have read Jolene's beauty food tips - I love dark chocolate and have been gulping down "green smoothies" made with leafy greens with my breakfast. YES!! She actually talked about green smoothies, but I like my salads and don't mind eating leaves :)) Thanks babe!! Good thing i LOVE dark chocolate, good for my skin too! Also, love the look of Full Speed! Lovely! Merci ma cherie!!! I was so relieved to learn that dark chocolate is good for the skin, I actually always thought the opposite!! 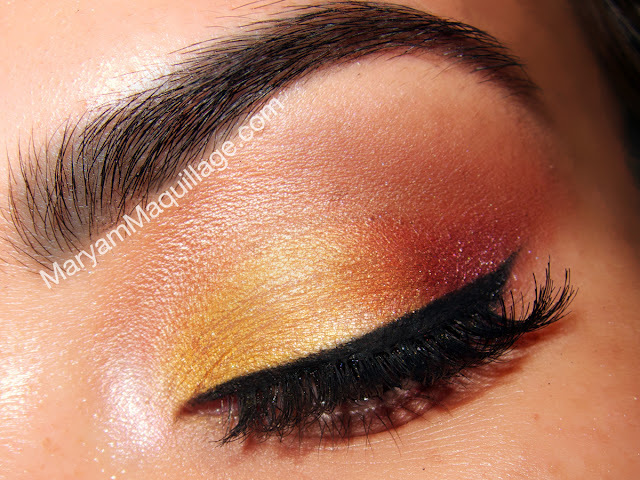 great EOTD and the lipstick shade is also very pretty .. great tips ..
Really nice, beautiful bright colors! So beautiful! Your make up is perfect! Oh my god, love the color combos! lovely eyelook, the colors look amazing!! Your eyemake up is stunning its like a sunset!! awww thanks Christine :)) yes, these shadows are packed with color and saturation -- that's why I love them!! I really love this look! And you are simply gorgeous!!! Could you tell what you thiink about my blog, please? great eye makeup so cool!!!! gorgeous eye makeup and I love the tips. definitely going to try the lemon and warm water every morning! Gorgeous! Reminds me of a sunset! you are so gorgeous! wow! and your blog is awesome, im gonna read every post! lol love your make up especially the lip color. This is such a beautiful makeup look! I love it! You're very talented and beautiful! Thank you so much for the sweet comment on my blog! If you decided to try to make the headband please post a picture on my facebook or tweet me! I'd love to see it! Great post and tips. U look beautiful as always honey, love that lipstick on u! Wow, love your eyemakeup. Very unusual eyemakeup colours but soooo pretty! Follow each other? Hope you like my blog! tu es trop belle, j'adore ce que tu portes sur les levres. You look darling. I love your pictures and your makeup looks great. Love all of your tips. Simply GREAT1 Love this look! and you are beautiful! Great tips! I'm going to try that lemon detox tomorrow. And I love the eye shadow,.It's so pretty! As usual, you look beautiful. 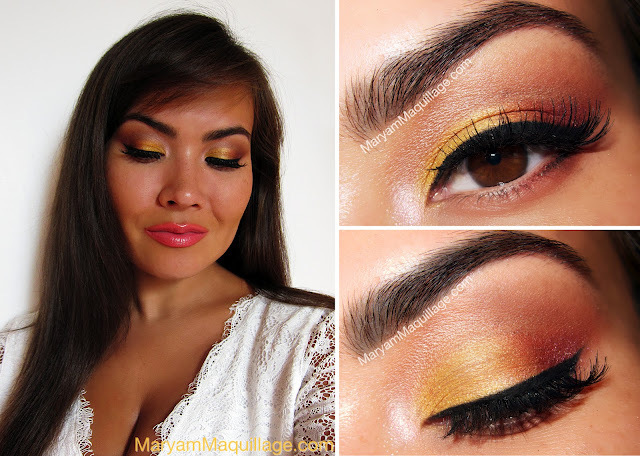 From blending, to the liner, it's a perfect sunny look. Thnak you for following me!